One of the more interesting nuggets to pop up in the blogosphere was this piece from John Harper in the New York Daily News on Monday. Outlined in that article is the recently fired Tony Bernazard’s strategy for Mets hitters. Simply put, the strategy is to hit the ball to the opposite field. 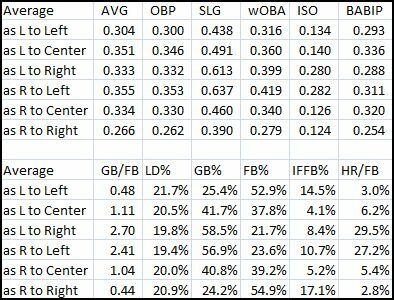 Looking at the two “pull” rows (L to Right, R to Left), we see markedly higher power, even though lefties tend to get more hits to center field. Pulling the ball does result in far more ground balls than fly balls, whereas pushing the ball has an opposite effect. Normally, fly ball hitters are better, as fly ball hitters have more power. That’s not true in this case, as about 10 times as many fly balls leave the park when pulled as opposed to pushed. Add in the fact that more ground balls fall in for hits than in-play fly balls do and it’s clear that pulling the baseball leads to far better offensive results than pushing the ball. According to wOBA, the difference between pulling and pushing comes to about 43 runs for left handed batters and a whopping 73 runs for righties – this is perhaps a result of shifts employed against left handed sluggers, but that is a topic for another time. Pulling the ball is not going to work every time. Many of the pulled ground balls that we see are easy outs to the shortstop or second baseman on balls on the outer half of the plate that should be hit to the opposite field. Mechanically, however, it just doesn’t make sense to make pushing the ball the other way a general strategy on more than just outside pitches, especially for MLB hitters who already have tremendous plate coverage abilities. In order to generate the kind of power needed to produce runs in the major leagues, the hips need to be able to open up and “lead the hands to the ball,” creating power through bat speed. Try and swing a bat without moving your hips, and then let your hips rotate as part of the swing – the difference is clear. Removing the hip turn takes away the power of the lower body. The action of rotating the hips drives the bat towards the pull side of the field, resulting in a pulled ball. That’s why pulled balls are generally hit more powerfully. This is particularly true on inside pitches, which allow for more extension of the arms and rotation of the hips prior to contact as they are closer to the batter’s body. On the other hand, to hit the ball the other way, the rotation of the hips has to come after the point of contact. Since this rotation is coming later, the bat speed won’t be as high. This also results in a deeper optimal point of contact, and thus the ball will be hit to the opposite field. It’s necessary to make this sacrifice on outside pitches, as early rotation would either result in poor contact or a miss, as the ball is farther away from the batter’s body. Essentially, to focus on hitting the ball the other way is to sacrifice power, both in the sense of home runs and in the sense of speed off the bat. The amount of weak ground balls hit to the pull side may decrease, but we would expect to see more infield fly balls to the push side (as supported in the split data) and fewer home runs overall (again, supported by the split data). Although with certain individuals, this strategy may win out, it will almost certainly lose at the team level, where the hitters as a whole will profile as close to average. Regardless of your point of view, a scouting or mechanics perspective or a data-oriented perspective, there is simply nothing there to support this strategy. The fact that a team in the most competitive baseball league in the world would consider this strategy not only as a team-level strategy but also as an organizational philosophy is mind-blowing. The fact that Tony Bernazard’s idea became Mets dogma is indicting of the upper management as a whole. With good, smart leadership, this strategy is never even discussed, much less employed. We hoped you liked reading The Mets’ Opposite Field Strategy by Jack Moore! There was a lot of ink spilled covering this strategy and the drills to enforce it last spring training and not one peep of dissent. I strongly disagree with this. Posts and comments at a ton of Mets blogs panned the ridiculous 80 pitch opposite field drill. The reason for using it was stupid, too. Instead of just accept that the Phillies player better in September overall to take the division title and move on, the Mets ascribed blame and did ridiculous stuff like that. In 2007, September was their HIGHEST team OPS month. Their 2007 September ERA was their highest month, and a tie for highest in 2008.